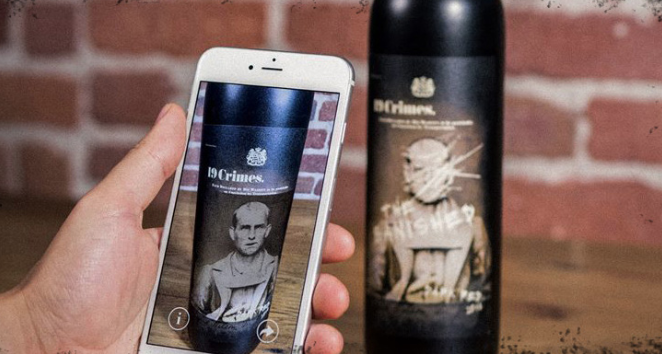 Winemaker 19 Crimes has launched the first ever augmented reality (AR) wine labels in an attempt to market to millennials. Every 19 Crimes wine label tells the story of different 18th century convicts who became colonists and committed one of the 19 crimes punishable by transportation. Consumers can use their smartphones to hover over the label to reveal the story of the convict on the label. Nick McArdle, 19 Crimes ambassador, said in a statement: “19 Crimes has used technology to break down the barriers normally associated with wine, such as tradition, heritage, and region. We are challenging these conventions and cutting out the ‘wine talk’ that may be intimidating to some wine drinkers. I can just see all these “millennials” peering at their smartphones absorbing the story and ignoring the actual wine itself. Next we’ll have Bega putting VR labels on cheese to describe the heritage of the breed of cow (or sheep or goat or camel or yak). “But, but… Fat Yak is a beer isn’t it?” asks the millennial who has read the label. Sorry 19 Crimes. A damn good salesperson sold you a pup there. Agree with David above, not sure if Millennials will care about this but it is a pretty fun execution. Just wish you didn’t need to download a seperate app to bring the labels to life. ….. never let them get in the way of a good story (or brand)….